Cafeteria tables with stools are especially good for older students, offering more personal space than classic bench models. Large ribs, specialty hardware and a steel washer inside each high-impact stool ensure that they will hold up for years and years of use. For safe and easy folding and unfolding, these lunchroom tables have a torsion-bar system allowing a one-person fold and an automatic lock which engages whenever the table is fully opened or closed. 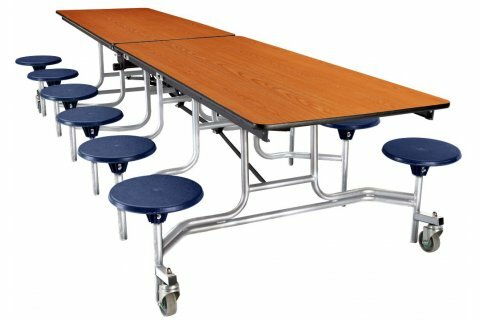 NPS cafeteria tables are designed for strength and safety. Extra-wide, heavy-duty casters lift off the floor when the table is opened. To prevent tripping, they do not stick out beyond the stools. 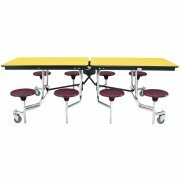 Laminate tabletops have a phenolic backer for easy cleaning and enhanced hygiene. 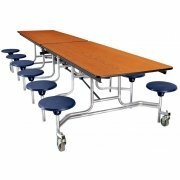 With robust support from a steel frame, steel aprons and tamper-free hardware, these tables are an exceptionally sturdy choice.